Pregnancy is often described as a time of joy. Once youre expecting yourself, it quickly becomes clear that pregnancy is also a time when you are bombarded with (unwanted) advice, and a time when you worry yourself crazy. Nutrition is one hot-button issue that you are likely to have lots of questions about, while physical activity is the other. 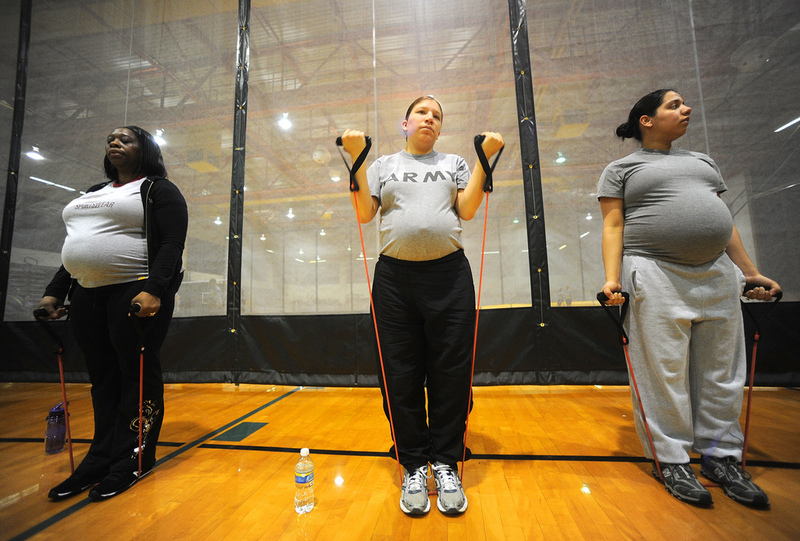 What should every expectant mom know about exercise and fitness during pregnancy? Labor and birth are often compared to running a marathon, and with reason. When youre going to run a marathon, you certainly train — you run, though never the whole 26 miles, and you make sure you have strength as well as stamina. While you can never know what running a marathon is like before you do it, you know that training is going to make it easier. Keeping fit during pregnancy is going to prepare you for labor and birth. It will also help you recover more quickly after you have your baby. More than that, though, exercise and physical activity should be a part of life for almost everyone, and pregnant women are really no different. In fact, exercising regularly might even reduce some nasty pregnancy signs, like morning sickness and fatigue. Some people recommend that you stick to gentle exercises (like stretching!) while you are expecting. Healthy women with low-risk pregnancies and no other physical limitations really dont have the need to restrict themselves that much. Those who worked out regularly before they got pregnant can continue to do so. Those who werent as active as they should have been should always build their exercise routines up slowly — something that is true when you are not pregnant as well. Walking, swimming, cycling, strength training, yoga, and pilates are all examples of exercises that are generally safe during pregnancy. Of course, everything you do carries a certain amount of risk. It is up to you to assess which risks are acceptable, and which arent. Dutch women routinely keep on cycling throughout their pregnancies, for instance, but some may decide that theyd rather not run the risk of falling off their bikes. Horse-riding carries a similar risk, and team sports also tend to come with the chance of bumping into someone or a ball hitting your pregnant abdomen. For a list of the safest pregnancy exercises, click the link. Most people will agree that sports that are always high risk are not a good idea during pregnancy at all. You dont want to go bungee jumping, white water rafting, or do risky rock climbs. High-impact sports such as karate are also a bad idea. Do keep in mind that your joints relax during pregnancy, to accommodate the growing baby. Sports injuries are slightly more likely while you are expecting for that reason. If you are in doubt, talking to your OBGYN or midwife about your pregnancy exercise plans is always a very good idea. You might go for long walks every day, swim every week and attend a regular prenatal yoga class. Youre still not completely covered. All women (and yes, men too!) benefit from Kegel exercises. Pregnant women really, really benefit from these little invisible exercises. Doing your Kegels every day will keep your pelvic floor strong. This will help you during pregnancy, while you are giving birth, and it will speed up your postpartum recovery. Whats more, regular Kegel exercises are going to help towards preventing urinary incontinence, something you really dont want. The good news is that you can do your Kegels anywhere, at any time — while waiting in a queue, on the bus, at your desk and nobody will even know you are multitasking! Exercise and fitness are incredibly important during pregnancy, as they are when you are not pregnant. Still, there are some circumstances in which you should take it easy. When should you quit exercising? Simply put, when your doctor says so. High-risk pregnancies — especially situations that require bed rest — tend to rule exercising out. If you have high blood pressure, preeclampsia, are carrying twins or more, or have pregnancy bleeding (due to placenta previa, for instance), everything but the most gentle exercises is going to be a problem. On the other hand, some pregnancy complications get better with exercise — think gestational diabetes. When in doubt, always consult your OBGYN about exercise and other physical activities.